This product review is going to read more like a rave, but that's because I really love Givenchy's Mister Light Instant Light Corrective Pen ($37 at Sephora) that much. Its specs are somewhat similar to YSL's legendary Touche Eclat in that it's a brush-tipped concealer pen meant to conceal and brighten at the same time. However, Givenchy's version also boasts SPF 10 (always a plus). Having never tried Touche Eclat, I don't know how the two concealer pens compare to each other. What I do know is that shade #3 (Mister Toast) suits my fair Asian skin and provides sheer to medium coverage--perfect for summer days where I want to look groomed but not overdone. The concealer has a creamy consistency and doesn't settle into fine lines after long periods of wear. I love how easy it is to apply too: a couple clicks of the pen, a couple brushstrokes on the face, and blend in the concealer with clean fingers. No makeup brushes to wash, no separate concealer and colour corrector products to erase my dark under-eye circles. Talk about a morning time-saver. 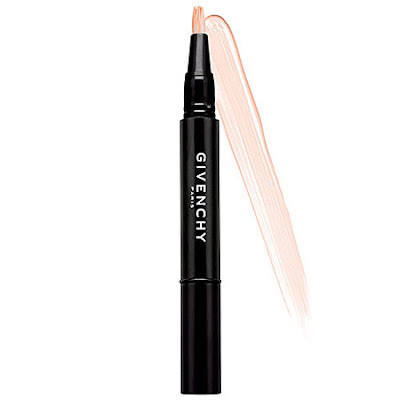 Have you tried either of these concealer pens? Sounds just like Touche Eclat, which I never leave home without! I'm officially a hoarder. I have four sticks: two different shades (one for winter, one for summer) and two of each (one for home, one for the bag).